﻿﻿﻿﻿﻿﻿﻿Most of the French Journos document Roger's artificially steroid enhanced calves as the major reason he has won slams. When these calves are not juiced, Federer is quite human and loses with regularity...outside the slams. When juiced to the gills for the Slams, Fed is almost unstoppable unless he runs into a player with superior talent and skill like Rafa Nadal. The rumours have been there since the start of his career. Then he came back with even more vigor after his incredible run at Roland Garros. The amazing performances of Roger Federer, are they due to doping? For two weeks, Grand Chelem conducted the survey. The revelations are explosive and imply that the ITF has seriously questioned whether the Swiss player had the right to even play on grass. It didn't even take ten seconds. By the end of the Federer-Nadal final at Roland Garros, the survey site had literally exploded under numerous queries by Google users around the world all motivated by the same curiosity. Whenever two key words that hurt and speak louder than a bomb circulate around, the rumors are renewed about the Swiss star that have been there since the beginning of his career. Those two key words we discovered: "Federer + Doping". So much for the subliminal message of the day, this is what seemed to sum up a final at Roland Garros, which had once again raised its share of issues. 4 years now it has been; how could Roger Federer accumulate such results at the top of the Tennis world? And above all, how could he do without suffering the fatigue that had hit all his predecessors, Sampras, McEnroe, Edberg who all felt fatigue in similar circumstances? [Editor's note: EPO is used in Cycling to combat fatigue. And overuse of EPO leads to Mono.] Why is Federer not even sweating at the end of these matches? How could he have even made all these consecutive Semi-Finals undefeated on all surfaces in the world but never once hurt? And referencing Roland Garros 2007, once again, how did the Swiss reach the final and even take a set off Rafael Nadal when no other player had done that this year and when all the world knows that the Spaniard is the great expert on clay? How is all this possible, by God!? Of course the physical nature of Federer did not help. For years everyone did a face with a knowing look when looking at the huge calves the man from Switzerland was displaying at the entrance of the court. It was alleged that he proudly showed off those calves to intimidate the adversary at the toss. Tennis is a game based primarily on speed and leg drive at the moment of ball impact, it is clear in any case that there was an explosion of muscular calves for Federer during his time on the junior circuit, and the arrival of those muscular calves on the senior circuit has written a lot of ink. Angered by the atmosphere of suspicion fueled by journalists, the world's No. 1 had also ended up cracking at a press conference, and became famous for the constant nastiness swung towards his great rival of the moment, "Nadal has bigger calves than me, but ask yourself why he wears cropped trousers." Nadal, when asked by Spanish newspaper Marca on his way to the beach with the calves in question, had preferred not to comment on this statement. Nadal was not worried in the least at his own legitimacy, but Federer continued to cause problems not only to his allies and power figures in Tennis, but especially the players themselves. A first very discreet sling was organized by the French players to be incendiary language lashed out at Nadal, at every turn manipulated by the Swiss star. France, which as everyone knows, is not a place where you dope, could hardly accept a small neighboring country that can do better than its own players. The French players were also allowed to run the same rumors about players from Belgium, on the calves of Justine Henin who should not even be compared, with those of Kim Clijsters, who had left prematurely rather than risking a control that would reveal the potential positive test. Despite the growing number of doping controls, the results, like it or not, remain opaque. A reminder: since January 1st this year, the International Federation organizes all doping tests in tennis. All controls that are done in tennis are the responsibility of the International Federation, whether both ATP, WTA, Grand Slams or the Davis Cup and Fed Cup. All these controls are tested and sent to the laboratory in Montreal. So there is a coherence and consistency in all controls. The implication of the matter is that the Chatenay-Malabry laboratory has, with a lot of great athletes singled out, a tainted reputation that may fatally destroy a Federation wishing to preserve its image and that of its best representatives. And this is all run and enforced by the ITF. With the ITF running the testing, anything is possible ...including that Federer is playing doped with no reprimands. I've seen folks here analyze some of other player's pics where their muscles look oddly defined. And in that pic, Fed's muscles do look oddly prominent. Maybe doping is behind his resurgence since Wimbledon? Up till Wimbledon, he had only reached 2 finals in the whole year. Since Wimbledon, he has reached 4 finals in 5 tournaments, and a semi in the other. I find it suspicious and think he may be using PEDs. I'm a Fed fan, but after reading that French article, I have to admit he might be doping. I'm a huge Federer fan, but there is no denying that he is a doper after reaing that French expose. I feel so betrayed. I never thought Roger would stoop down to the level of the other cheats. First of all, let me admit that people have accused me of being a "Fedtard". I just researched that pic thinking it must have been photo-shopped. To my horror, it wasn't. It is legit! That Federer pic has left me stunned. It is now abundantly clear that he is a doper as well. The French Journos knew it years ago! Is there anyone in tennis who is not doping? Tennis needs to make a statement by stripping Federer and Nadal of all their records, titles and prize money. Surely the usage of PED's in sport should be of constant and thorough scrutiny with the harshest of penalties for those that are found guilty. Proper, random testing by a truly independent body along with harsh penalty (like banning Federer from the sport, or loss of titles) is the only way to clean up sports. These methods need to be applied to Roger Federer as soon as possible. While i love the sport of tennis and regularly enjoy watching federer, nadal, not to mention the personality and tenacity of djokovic, murray etc - my only hope is that the people that care about this issue focus their energy not solely on catching Roger, (which will be part of the process since it is obvious he is using PEDs) but instead on inspiring the appropriate changes in the tennis world to create a future where doping isn't possible. As a Federer fan, I am surprised by that pic. I have to conclude that Roger is a doper as well. Roger is innocent! I refuse to believe any of this! Let me see if I can help some of the Roger fans like Freddy and Steve that seem to be having a hard time accepting the overwhelming evidence. The majority of the Fed fans seem to be handling it better. At some point in our lives, each of us faces the loss of something dear to us. The grief that follows such a loss can seem unbearable, but grief is actually a healing process. Grief is the emotional suffering we feel after a loss of some kind. The death of fanatical worship of a sports star, loss of innocence, even intense disappointment can cause grief. Dr. Elisabeth Kubler-Ross has named five stages of grief people go through following a serious loss. Sometimes people get stuck in one of the first four stages. Their lives can be painful until they move to the fifth stage - Acceptance. The grieving person may then be furious at the person who inflicted the hurt (even if they are right), or at the world, for letting it happen. He/She may be angry with themself for letting the event take place, even if, realistically, nothing could have stopped it. Now the grieving person may make bargains with God, asking, "If I do this, can you make Federer innocent even when he is doping?" This is when the anger, sadness and mourning have tapered off. The person simply accepts the reality that Roger is doping. If you would like to do so, you can take on the role of therapist for the site. I know you do that in your "non-virtual" world. Something tells me from some of the Comments here, you may have to take the practice off-line with some of the diehard Fed Fans that take this all very personally and refuse to accept the reality of it all. I believe most therapists would say it is healthier if they can find some venue or target to get out their feelings of anger, betrayal and bitterness. If that is part of my role, I accept it. I'm a huge Federer fan and will do whatever I can do to help. You're doing a good job, but you need to address more issues. - The incredible dominance (92-5 win-loss record in 2006; 81-4 win-loss record in 2007). In order to be able to play and win so many matches in one year you need incredible stamina (ask Jim Courier). 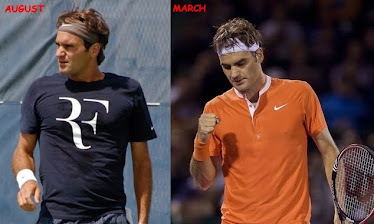 Players usually get tired at the end of the season; but Federer won almost everything, starting with the Australian Open and ending with the World Tour Finals. That's incredible. Between US Open 2006 and Indian Wells 2007 he didn't lose ANY match. - In 2005 he had "foot injuries", which didn't stop him from winning Wimbledon or the US Open, but only stopped him from competing in Montreal and miss almost the entire indoor season. After that he had the best year of his career. Coincidence? - Both of his parents worked in the pharmaceutical industry, therefore Roger could have access to the best products on the market. - In Rome 2006 he had a tough road until the final, he played many 3 set matches and despite that, he was able to play for more than 5 hours against Nadal and almost win the match (without having any day of rest before this match). - Suspicious bathroom breaks. Davydenko was dominating him at the AO this year, but after a few minutes Federer went to the bathroom and the things have changed drastically after that. Again, in Wimbledon, Falla was dominating him but before the start of the fifth set Federer went to the bathroom and after that he won the set with 6-0. Coincidence? - Andy Murray beats Federer in best of 3 matches, but not in best of 5. Why is that? Federer is obviously more "prepared" for Grand Slams. - His "lung infection" this year, which came right after winning a Grand Slam. Maybe he needed time to "cool off". - The mononucleosis from 2008. It could have been just an excuse for the fact that he didn't take his vitamins and, obviously, was weaker than usual. Andy, fantastic post! Thanks a ton for all the ideas. I will save your post as a reference. The blog is only in its first week (4 days old), so I had a few of your ideas in mind for future posts, but you've listed some that I hadn't thought of yet or forgotten (e.g. Murray's record in best of 3 matches vs. Slams; the bathroom break against Kolya at the AO). I want to cover all these topics and maybe come back to a few when this becomes more intuitive. For example, the major fact outlined in this Post is that Roger does have a "physical advantage" in his calf muscles and quadriceps. This article outlines that Tennis is "based primarily on speed and leg drive at the moment of ball impact", but people are too preoccupied with Nadal's biceps and and deltoids. Also, I find it interesting that Roger himself was responsible for most of the poisoning of Rafa's image by manipulating the French players into making unsubtle comments and making back-handed remarks himself about Rafa. He might be more responsible for the fact Nadal seems to be the only target for people who want to clean up the sport. And by having that venom all directed at one player and censorship if anyone mentions Roger, this leads the movement nowhere. That is one reason behind this website. As I see it, it is the only place where a person can discuss Roger Federer and doping. Please continue to leave great comments and feel free to point out any articles (I've found better ones in French, German and Spanish) that speculate on the issues as well. -Tennis is a game more determined by muscles in the legs than arms. Advantage Roger. -Federer has been suspected of doping for his entire career. But people seem to be forgetting that now. -Federer helped spread venomous suggestions about Nadal when it became clear Nadal would be his chief rival. Rafa did nothing but ignore it. But it may be one of the biggest reasons most "doping" hatred is directed at Rafa and not Roger. Rafa acts as a shield for Roger, and thus makes him untouchable to cynics. We saw what happened to another "untouchable" in Tiger Woods when one single incident blew down his house of cards. Now everyone knows Tiger has used illegal PEDs. -The ITF is not interested in catching Roger. You're an idiot! Nadal is the one who is doping. Get a clue! "You're an idiot! Nadal is the one who is doping. Get a clue!" I love those guys who can easily distinguish between a doping and a clean athlete. Obviously it's an ability that the rest of the world was not gifted with. "Nadal is the one who is doping." That's not an argument. What does that have to do with Federer and his PED use? It's like telling Claudia Schiffer that she isn't beautiful because Heidi Klum is beautiful. "I love those guys who can easily distinguish between a doping and a clean athlete. Obviously it's an ability that the rest of the world was not gifted with." -Simultaneously born with a innate hatred for Rafael Nadal. -Their powers seem to increase in magnitude with every slam Rafa wins. I do not know what to think about doping. It certainly is a sensitive topic. The problem is: Investigators often do not only deal with the dopers themselves but with a whole bunch of crazy fans. If we do not trust the official authorities, who do we trust? Charging supervision to the fans will only lead to fan wars. The greengrocer's apostrophe is embarrassing. Federers' calves -> calves of several Federers. I made the necessary grammatical corrections in the title and my intro. The article itself never used it in a possesive manner as I did. Thanks for letting me know. I am a RAFAEL NADAL fan, and I have to admit that he has been DOPING all along. That is why Rafa has constant injuries. His DOPING regime is during the off-season. He constantly wards off the ATP Anti-doping agency, and has complained endless about random testing, whereas Roger Federer HAS ALWAYS WELCOMED the Anti-Doping agency, and willingly assisted them in their probes. During the 2010 USOPEN, Rafael Nadal was able to increase his serve speed - LITERALLY OVERNIGHT - - by as much as 20mph! This is unthinkable without juicing. The "juice" that was injected into his massive arms and shoulders is beginning to adversely affect his body that is why tenditis has developed in his shoulders. Now, they are pumping new drugs into him to prepare him for the WTF in London. Watch how fast he serves in London because that will tell us how much juice was pumped into him while he's been away from competition. Rafael JUICEMASTER Nadal started to wear short-sleeved polo shirts in 2008 in an attempt to hide his massive JUICED UP muscles, but he is not fooling anyone. RAFAEL NADAL is the Dopemaster-General of the ATP Tour and should be banned from active competition immediately. RAFA FANS CANNOT DEFEND HIM IN THE FACE OF ALL THIS EVIDENCE - HE IS DOPING, THEREFORE HE IS AGAINST TOUGH DOPING RULES. Thanks for your feedback. The name of this blog is "Roger Federer is Doping" and any discussion of Rafael Nadal, unless directly related to Roger's doping methods or evidence, is not relevant to the blogs subject matter. If you have any evidence that Rafael Nadal provided Roger Federer with designer steroids, HGH, EPO or any other illegal PEDs, then let me know and provide some links and we can discuss Nadal under those circumstances. I've put up a new poll that addresses appropriate topics and circumstantial evidence that we will discuss about Roger Federer's doping past in today's post so that fans will have an idea of what we can explore on this blog. If you have any ideas on Roger Federer's use of illegal PEDs, please feel free to post any of your ideas. Q. Which ATP Player, at the tender age of 24, is beginning to show signs of balding? Did Roger ever ask his calves what they felt before he doped up? They are just trying to burst free out of his legs and lead a happy steroid-free existence. Shame on you, Roger, for doping up your innocent calves.